More property owners are choosing to install automatic bollards because of their significant benefits. As an attractive alternative to gates, customers often install automatic bollards if there is a need for increased security and if a gate is not structurally feasible or visually appealing. There are also other important benefits to using automatic bollards on your property. The automatic bollard is the most convenient choice when it comes to bollards. Automatic bollards are retractable, which means you can choose to have them completely out of sight. However, when you need your bollard for security or protection, it is easily raised in a matter of seconds. This quick automated retractable feature allows for simple management. For example, a driveway bollard is extremely useful for access control when a gate is not desired. An automatic bollard is smaller than a gate yet still offers the same high security protection to prevent vehicles from parking in your driveway. It is also more convenient than a gate because you don’t have to get out of your car. Simply use the remote to retract the bollard, and drive in. After you have parked your car, raise the automatic bollard again with the push of a button. Often around a building’s premises certain areas must be blocked to road traffic but still need to remain open to pedestrians. The automatic bollard provides a convenient, low maintenance solution. Aesthetics are important to many property owners. Having a retractable, modern-looking automatic bollard can (literally) raise the value of a property. Compared to other security options, your property will look cleaner and more appealing. Moreover, as a homeowner it can be extremely annoying when a driver parks on the verge of your property, especially on your lawn or garden, when parking is in short supply. This does not only look bad, but is also frustrating to deal with. Installing an automatic bollard gives you the freedom to choose when you want to use a bollard with a simple flick of the switch. Safety bollards are essential structures for preventing accidents and controlling access to designated areas. Security bollards are often used to prevent access to an area. 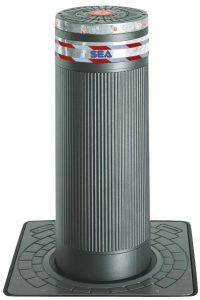 The automatic security bollard can act as a deterrent to trespassers. No one will want to compete with a steel bollard! The automatic bollard will fend off attempts at crossing over a property’s boundary in a car. Traffic bollards are used in areas where there is significant pedestrian and car traffic. They are important means to protect pedestrians from injuries caused by wayward vehicles or accidents. Cars attempting to enter or exit tight parking lots might end up mounting a curb and accidentally cause damage to your property. An automatic bollard effectively blocks vehicles from mounting curbs or sidewalks. The return on investment is high. Automatic bollards prevent potential damage to your property and all of its infrastructure. Preventing damage to your property also saves you time and energy. Of course, no one can put a price on protecting your loved ones, employees, or tenants from being harmed by an unwanted vehicle crashing on to your property. Commercial Gate Systems offers a range of high quality automatic bollards in different styles and models. For more information click here.